Like Predecessor, New Justice Dept. Claiming Privilege. Civil liberties advocates are accusing the Obama administration of forsaking campaign rhetoric and adopting the same expansive arguments that his predecessor used to cloak some of the most sensitive intelligence-gathering programs of the Bush White House. TVNL Comment: How is that for change? Are you Democrats getting the picture yet? The justices' review of the slashing documentary financed by longtime critics of Secretary of State Hillary Rodham Clinton could bring more than just a thumbs up or thumbs down. It may settle the question of whether the government can regulate a politically charged film as a campaign ad. David Bossie, a former Republican congressional aide who produced the Clinton movie and another describing then-Sen. Barack Obama as an overhyped media darling, said his films are about important moments in American politics. "The outcome of this case will dictate how we're able to make films and educate people about them," he said. Hundreds of statewide and local residents turned out today for a Symposium on Corruption held in Bensenville, Illinois, just outside of Chicago. Sponsored by Citizens Against Government Waste, the symposium brought together leaders from throughout the state to debate and discuss how to unravel the economic and social cost of corruption in Illinois, provide ideas for effective government reform and restoring voter confidence. The Symposium took place at Fenton Community High School in Bensenville, IL. Are You a Domestic Terrorist? The report was put together by the Missouri Information Analysis Center. It warns that militia members, most commonly associate with third-party political groups. They may display constitutional party, campaign for liberty or libertarian material. Militia members are quote, "usually supporters of Ron Paul or Chuck Baldwin or Bob Barr." A motivation for militia activity, according to the government now, is the anticipation of the economic collapse of the U.S. Government. Oh. And the report continues that militia members may have cartoons and bumper stickers. Yes, with anti-government rhetoric. Or sometimes, they'll have a Ron Paul bumper sticker, or they'll have this flag, "Don't tread on me." Oh, it's a snake! 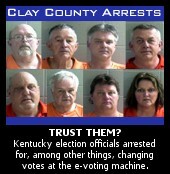 Clay County uses the horrible ES&S iVotronic system for all of its votes at the polling place. The iVotronic is a touch-screen Direct Recording Electronic (DRE) device, offering no evidence, of any kind, that any vote has ever been recorded as per the voter's intent. If the allegations are correct here, there would likely have been no way to discover, via post-election examination of machines or election results, that votes had been manipulated on these machines. A 29-year-old former Bush administration aide was sentenced today to 2 1/2 years in federal prison for stealing nearly $600,000 from a nonprofit group that promotes democracy in Cuba. Felipe E. Sixto of Miami pleaded guilty last year in U.S. District Court in the District to stealing from a federally funded program. Today, U.S. District Judge Reggie B. Walton called the crime an "elaborate scheme" that badly damaged the nonprofit group, the Center for a Free Cuba, where Sixto worked from 2003 through July 2007.